Working or party time in Puerto Rico? Democrats say the trip to Puerto Rico was planned months in advance and therefore could not be rescheduled until after the shutdown ends. 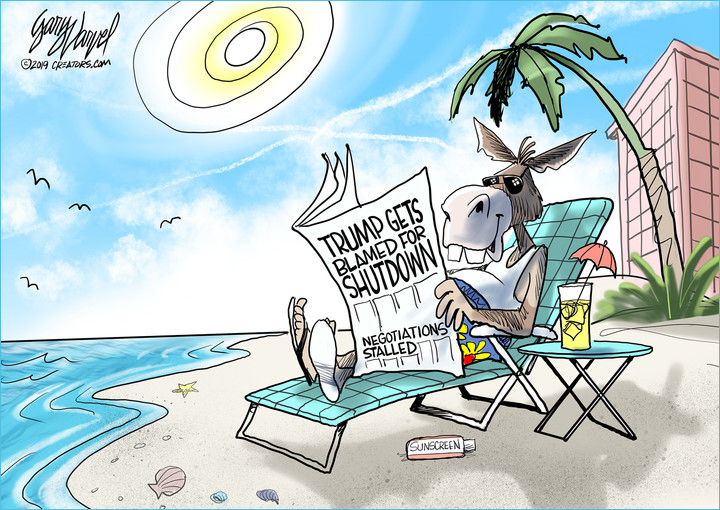 Is Speaker Pelosi correct to deny President Trump’s State of the Union address yet not oppose the Democrat House members’ working trip to a $400/night beach hotel? *The fundraising arm of the Congressional Hispanic Caucus, BOLD PAC, chartered a private jet for more than 30 lawmakers, as well as their families and chiefs of staff, to attend a winter retreat in San Juan, reported The Washington Examiner. In addition to meeting with officials to discuss the aftermath of Hurricane Maria, attendees were invited to multiple parties and a showing of the Broadway musical “Hamilton” during its opening week on the island. Lin-Manuel Miranda, Hamilton’s creator and star, invited lawmakers to the show with the hopes of securing more federal money for Puerto Rico’s cleanup, according to CBS News. Hurricane Maria ravaged the island in 2017 and even with aid from the Federal Emergency Management Agency (FEMA), the local government has still had trouble repairing the massive amount of destruction sustained by the island’s infrastructure. Other lobbyists that accompanied Democrats on the trip included Facebook, Comcast, Amazon, Verizon, PhRMA, and unions such as the National Education Association, reported The Examiner. While names of the House and Senate Democrats attending the trip have been kept under wraps, New Jersey Democratic Sen. Bob Menendez was spotted at the beach resort. House Speaker Nancy Pelosi was expected to be in attendance, however, it is not clear if she ultimately was able to join. Pelosi faced backlash in December for vacationing at a luxury resort in Hawaii amid the shutdown.